It was Teddy Roosevelt who said, "Speak softly and carry a big stick." A strange saying, but consider how important it is to stay quiet and get your work done - and how hard it is to do so at times. When you wear Chippewa Men's 25407 EH Waterproof Steel Toe USA-Mad ... (see full details) (see specifications) #CHP25407. It was Teddy Roosevelt who said, "Speak softly and carry a big stick." A strange saying, but consider how important it is to stay quiet and get your work done - and how hard it is to do so at times. When you wear Chippewa Men's 25407 EH Waterproof Steel Toe USA-Made Logger Boots, you can carry plenty of sticks while walking softly in modern-day style. The bay-colored apache leather uppers have a slightly pebbled finish for a look of depth, with waterproofing to keep you dry and comfortable. 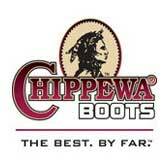 Chip-A-Tex waterproof booties on the insides of the Chippewa boots provide another layer of water-resistance. Matching Sta-tied laces have been waxed, so water rolls right off, and they look great with non-tarnishable antique brass hooks and eyelets in the front. Ruby Dri-Lex 2000 lining wicks moisture away from the feet on the interiors of the men's boots. Removable (easy-to-clean) cushioned orthotic insoles are made with Texon 460, and they're also treated for water-resistance. Flexible, durable Texon is used in the finest work footwear for superior cushioning and support. The iron rubber and iron robus combination midsoles are a rubber/leather combo that helps resist shock and flooring impact, while triple-ribbed steel shanks offer durable, fatigue-reducing support. It's all held together with Goodyear leather storm Welt construction, repairable stitches that connect the leather and Vibram Tacoma yellow plug outsoles of USA-made boots. Slip-resistant soles offer excellent traction and support, while ASTM-rated steel toes give you working safety. Even equipment is protected with ASTM electrical hazard certification, and when you're wearing the steel toe boots, you'll be guarded against open circuits. Speak softly with Chippewa Men's 25407 Waterproof Steel Toe Super Logger EH Boots. When you're wearing the waterproof boots, they speak for themselves. Choose Chippewa - because your feet shouldn't suffer from the loads you carry. I bought a pair of these Chippewa logger work boots 25407 because they were USA-made loggers with a waterproof membrane (haven't found another boot with these criteria, even from Red Wing). They have a Kush-n-Kollar which has a great padded ring around the boot opening and a flexible backstrap. These boots were "broken-in" right out of the box. VERY GOOD WORK HARD PLAY HARD BOOT. ITS ONE OF 3 BRANDS MY HUSBAND FAVORS AND WOULD NEVER BE WITH OUT A PAIR FOR REG USE OR STAND BY. HIS NEEDS FLUCTUATE FROM SEASON TO SEASON AND YOU WILL FIND DANNER AND WESCO BOOTS AS WELL IN HIS WORK CLOSET. THESE BOOTS ARE ABOVE AND BEYOND COMFORTABLE. I need the steel toe when them logs are fall'n down. Terrific boot at any cost. Well worth the money. I have ordered many times and always had good luck. Most of all I liked the boots, but the servic was superb. I am pleased with my entire order. These boots are great support for my feet. After all day on my feet walking around on various surfaces such as concrete, dirt, blacktop, ect... my feet were comfortable, did not ache, and stayed dry all the time. Leather was great, and even better given that they were MADE IN THE USA!!!!!! The steel toe is excellent and very hard great for kicking dirt off rakes, and protecting your feet. Chippewa Boots: Men's USA-Made 25407 Waterproof Steel Toe EH Logger Work Boots is being added to your cart.